Ramon van Opdorp reviews the 2018 Belgian Air Force Days air show held September 9-10 at Kleine Brogel Air Base. The Belgian Air Force Days 2018, hosted at Kleine Brogel air base, featured a long list of fast jet fighters in every shape and color. U.S. aircraft types were present in the shape of the F-18 Hornet (from Spain and Switzerland), and the F-16 Fighting Falcon (from Greece, Belgium and Denmark) in the air, and a F-35A (from Italy) on static. 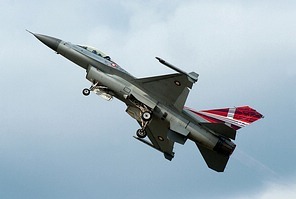 European aircraft types included the Gripen (Czech Republic), Rafale (France) and the Typhoon (UK). While all the former are very common aircraft seen in airshows around Europe, more rarely seen were the Russian built aircraft present in the shape of a MiG-29 (Slovakia) on static, and the massive Ukrainian Su-27 Flanker in the flying display in addition to a Su-27UB two-seater joining the single-seater in the static display. While Ukraine is working very hard to get rid of the former Soviet (and until recently, Russian) shackles, the Ukrainian Air Force very proudly showcases their capabilities and culture abroad. With the Soviet Union dissolving in 1991, a large batch of Soviet aircraft were inherited by the Ukraine, many of these aircraft continue to form the backbone of their air force. 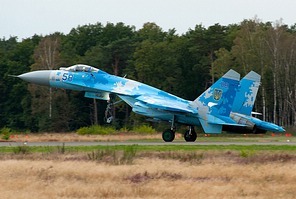 With a fleet of L-39s, MiG-29s, Su-24s, Su-25s and the Su-27, the Ukraine has a very notable air force . Due to the Russian annexation of Crimea and the ongoing conflict in the east of the country, the relations with Russia are now severed. Thanks to its solid domestic aerospace & defense base, the Ukrainian Air Force still managed to overhaul its combat fleet, which is arguably more potent today than at the start of the hostilities, also the training of new pilots was greatly stepped up. However, with the scars still fresh, the need for security under the wings of the NATO is now more desired than ever before. So perhaps it should not be surprising to see a modestly updated Su-27 flown by an experienced pilot at European airshows again, but nowadays without the need for Russian consent. All displays of course look a little the same; short radius turns, high AoA , high speed, and positive-G pulling outward fly-bys. You see displays evolve over the years, or degrade. While all solo jet displays are powerful and impressive, the Swiss F-18 display stood out this year. I had never seen the maneuver made after a steep take-off, as the F-18 leveled off in a straight positive-G pitch, 90 degrees angle. And this was repeated in the sequence, looking like the aircraft was flying in a square. The many fast high angle turns produced long vortexes over the wings. The F-16 from Denmark came on close second place The solo display was very tightly flown, and emphasized the power of the small, but nimble dogfighter. The Hornet from Spain was spectacular for another reason. The carrier-borne fighter engraved its presence forever in the Belgium tarmac as the tail hook locked after Saturday’s display, causing a massive shower of sparks on touch down. On to the much anticipated Su-27 demonstration… The display, honestly, was not spectacular, but it didn't need to be. This large beast of a machine did enough, and more, with its presence alone. Daydreaming of the world famous Pugachev’s Cobra maneuver, or a unrestricted climb, we were presented instead with a beautifully flown display that was fast and a little bit the same as the other displays. Most impressive, however, were the two tail slides, which would probably cause any contemporary fighter jet to fall uncontrollably to the ground in a flat spin. Seeing a massive fighter jet, weighing 16,000 kg, with twice the wing area of an F-16, launched into the air by its two mighty engines, each delivering 12,000 kg of thrust, is a sight to behold and remember. 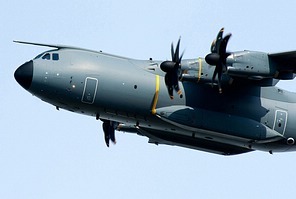 Last, but certainly not least, was the arrival and fly-by of the A400M Atlas, followed by a landing to join the static line-up. There were also two fly-bys (one clean and one dirty) by a USAF KC-135 tanker, normally based at Andrews AFB. Not to be outdone by the foreign guests, the Belgian Air Force displays were augmented by the “Thunder Tigers” formation of four F-16s, and a specially painted C-130 . 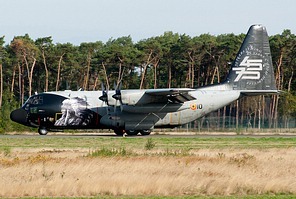 The “Thunder Tigers” also performed a fly-by with a RNLAF KDC-10 tanker on Saturday. I cannot emphasize enough how much I appreciate all the hard work that was put into this year’s show by the Belgium Air force and in particular the Kleine Brogel air base, which is responsible for a memorable list of historic fighter meets, impressive spotter days, and airshows. However, today’s entrance fee of €25, €10 for parking, and €2 for just using the toilet, plus the pricing of some distinctly average food from the vendors, all border on the extortionate. The main purpose of a defense day should be to show the residents of Belgium what is happening with their tax money, and in this case, showcasing contenders for the successor of the F-16, and of course, for the recruitment of future personnel for the Air Force. While that can go hand in hand with putting on an interesting display program, the addition of a Su-27 to a list of jets frequently seen performing at free events around Europe only just makes the pricing justifiable for enthusiasts, however it presents a hefty fee for a family. If the goal is to host a large international airshow with ticket pricing accordingly, then displays such as the Victors, Sonaca 200, Starduster Trescal, Team Raven, etcetera do not belong in the flying display, especially considering there are much better options. Although I have all the respect for the flying skills of their pilots, these aircraft are also far from what one expects from an event put on by the air force. Overall it was a very enjoyable day, with lots of fast jets. and the Su-27 display as the main headliner. The list of military aircraft will make most airshows jealous. On the other hand, pricing of everything was in my opinion far too high for what was presented. The good stuff was great, but the program was dragged out by mediocre displays and too many quiet moments. The event missed its chance to turn such a complete line-up of different jets, even including a Flanker, into a memorable airshow. Unfortunately, the distance of most air displays required nearly a telescope for great photography. Out of the control of the organization was the sad fact that flares were disallowed due to fire hazard.